FREE APPRAISAL. 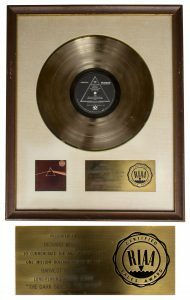 If you are looking to auction, buy, consign or sell a white matte RIAA award (aka as a white mat RIAA award) such as the Pink Floyd one we just sold for $25,000, please email Nate@NateDSanders.com or call the Nate D. Sanders Auction House (http://www.NateDSanders.com) at (310) 440-2982. Richard Wright’s personally owned white matte RIAA award for ”Dark Side of the Moon” by Pink Floyd, consistently ranked one of the greatest rock albums of all time. White matte RIAA award features a gold vinyl record above the album’s cover art and a plaque reading ”PRESENTED TO / RICHARD WRIGHT / TO COMMEMORATE THE SALE OF MORE THAN / ONE MILLION DOLLARS WORTH OF THE / HARVEST RECORDS / LONG-PLAYING RECORD ALBUM / ‘THE DARK SIDE OF THE MOON”’. Award is in original frame, with RIAA framer, New York Frame & Picture Co. label on paper backing. Measures 17.75” x 21.5”. Some nicks to wood frame, and a few spots of discoloration to matte at the very bottom, otherwise near fine condition. Accompanied by an LOA from Wright’s second wife, Franka Wright. One of the finest white matte RIAA award pieces one could hope to own. Sold for $25,000. FREE APPRAISAL. If you are looking to auction, buy, consign or sell a white matte RIAA award (aka as a white mat RIAA award), please email Nate@NateDSanders.com or call the Nate D. Sanders Auction House office (http://www.NateDSanders.com) at (310) 440-2982. Top dollar obtained for your White Matte RIAA Award.